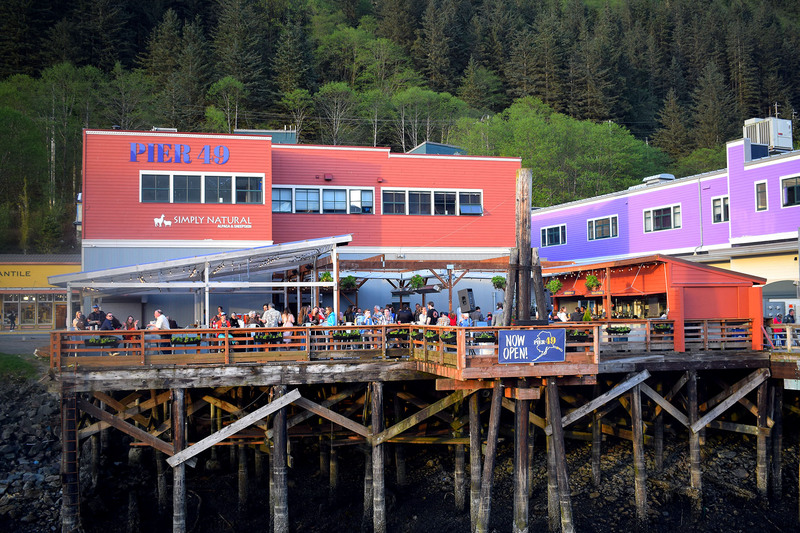 Dubbed the most scenic capital city in the US, Juneau, Alaska is rich in history, art, and Native heritage. The remote city, only accessible by boat or plane, offers picturesque views in any direction the eye wanders. 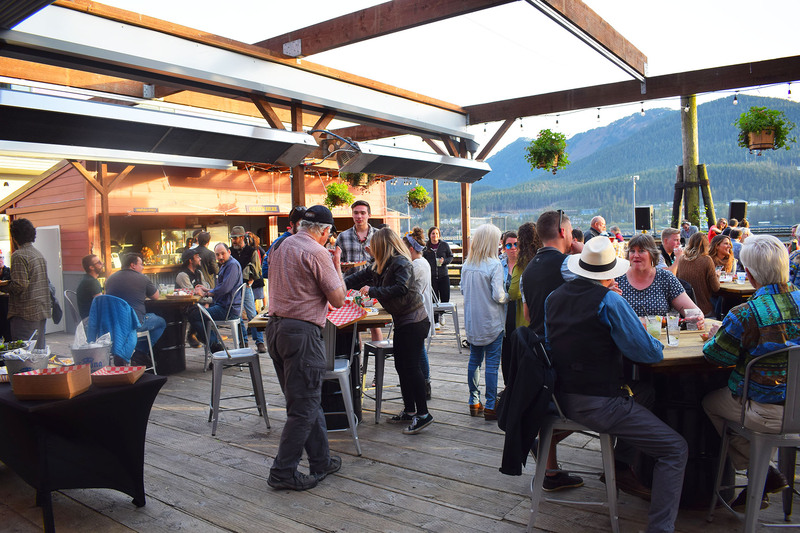 At a towering 3,500 feet above sea level, Mount Juneau’s peak often hides amongst the clouds, casting a shadow over the city as a humble reminder that nature is the almighty ruler of the far NorthWest. 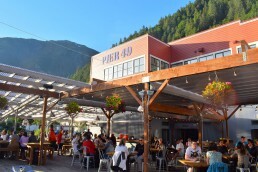 Named after a gold prospector, Juneau is the dream escape for outdoor enthusiasts. From sightseeing the fjords to wildlife excursions, one can marvel at all this majestical place has to offer. For the more adventurous, pristine black diamond trails and frozen waterfall hikes will spike your heart rate, while simultaneously taking your breath away. Between all that exploration and excitement comes the need to unwind and recharge. Look no further than Franklin St, a strip along the harbor filled with boutiques, jewellers, galleries, and endless amounts of Alaskan king crab to fill the belly. 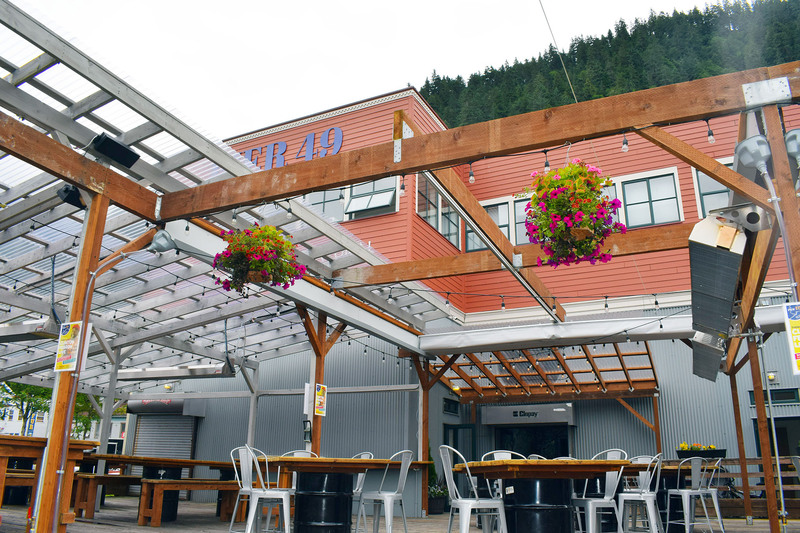 Located in the heart of the harbor is Pier 49, Juneau’s newest restaurant on the water. 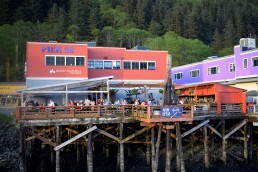 Charlie Herrington and the Juneau Waterfront Restaurant group knew they had to deliver something unique to the Waterfront boardwalk, something that would catch the patrons’ eyes and leave them with little choice as to where they were going to stop for a snack or beverage. 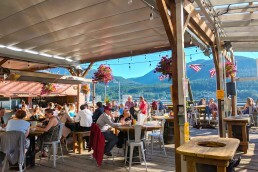 The harbor lacked a prominent waterfront patio. Charlie and Co. quickly realized a protected and comfortable outdoor lounging experience would be the differentiating factor for Pier 49. 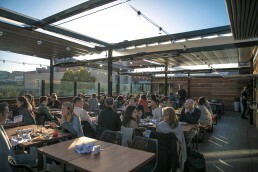 The challenge for the group became creating a space that could take advantage of the few sunny days, between the extended periods of drizzle and rain. 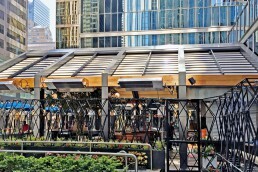 With the help of our Product Specialist, Pier 49 designed a large wood framed pergola with custom rain gutters. 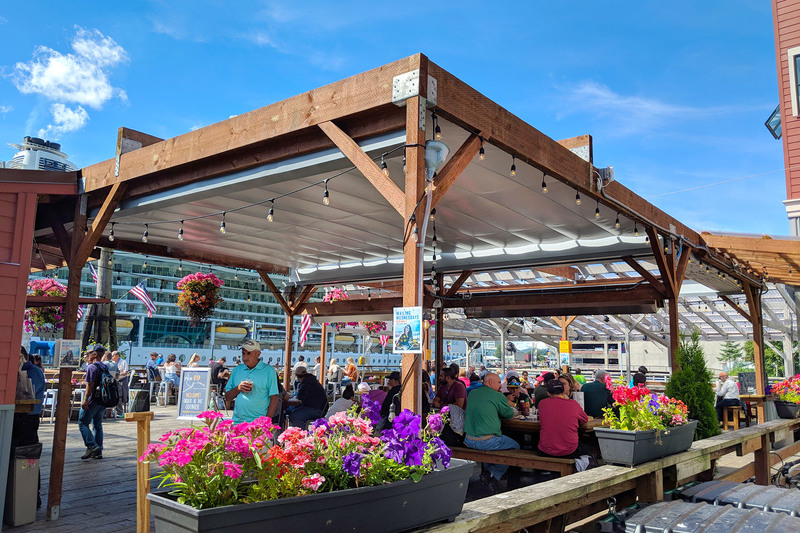 Once the plans were finalized, the integration of two large underside motorized canopies completed the space, providing watertight coverage to the previously open section of the waterfront patio. 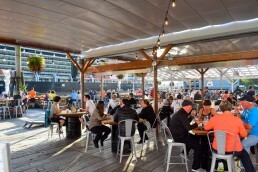 Electing to add the fire-retardant fabric line of Ferrari, Pier 49 was able to install large heaters on their structure providing much-required heat during those cool and drizzlingly days in the spring and fall. Coincidentally, they selected the fabric colour Boulder. We suspect it was added as a homage to the great Mount Juneau. 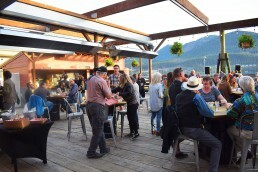 Either way, it was a great look to finish the space, and the end result is a fully occupied patio regardless of temperature, or precipitation. 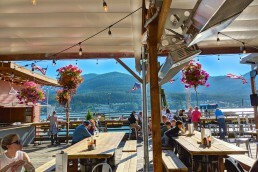 Whether marvelling at the size of the ships cruising the channel or taking in a sunset over the mountain range, Pier 49’s patio offers breathtaking views and an unmatched outdoor atmosphere. 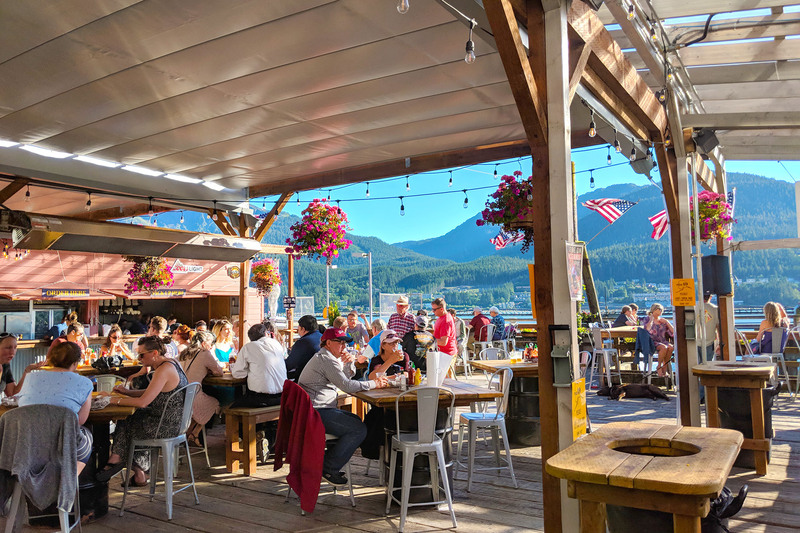 With a large covered patio and ample heating, patrons can enjoy Juneau’s world-class waterfront whether rain or shine. 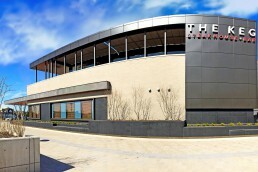 Find out more about our dynamic outdoor solutions. 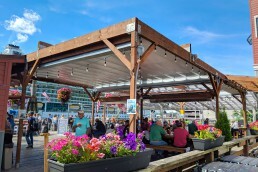 Two large underside motorized canopies paired with gutters provide complete coverage to the previously open section of the waterfront patio. 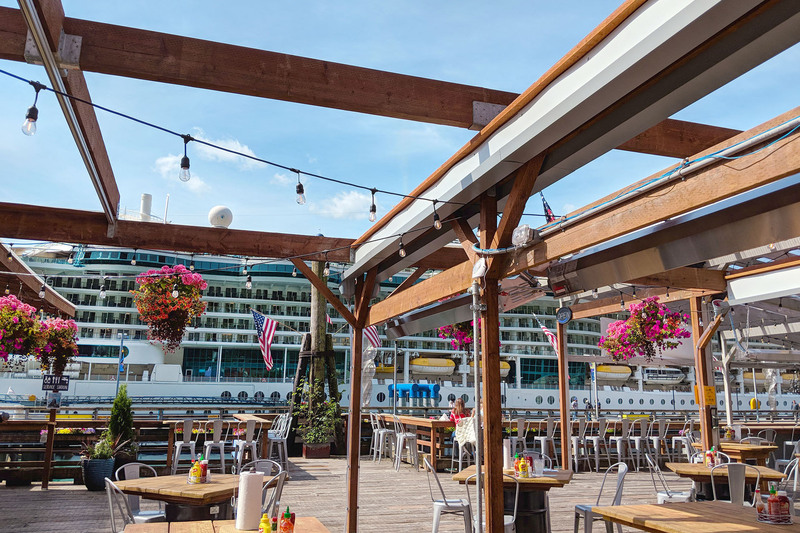 Electing to add the fire-retardant fabric line of Ferrari, Pier 49 was able to install large heaters on their structure providing much required heat during those cool and drizzlingly days in the spring and fall.